Real Estate Market Information - Buck Bukrinsky C.I.C. 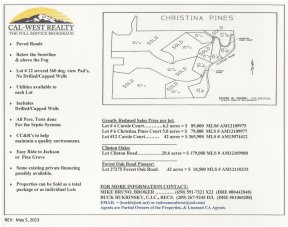 RECS. .
LOTS # 12 ON THE CUL-DE-SAC OF THE CAROLE COURT; IN NEWER 12 LOT SUBDIVISIONOF CRISTINA PINES WITH 4 COMPLETED HOMES BUILD. 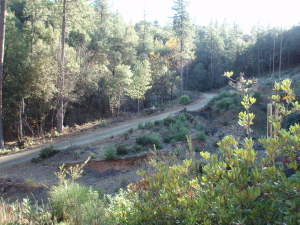 LOT HAS SEVERAL PADS WITH 360 DEGREE VIEWS. LOCATED BELOW THE SNOW LINE, AND ABOVE THE FOG. EASY RIDE TO JASCKSON AND PINE GROVE. PIIONEER LOT WITH ENGINEERED SAND FILTER SYSTEM SHOULD BE APPOVED FOR 2 BEDROOM HOME. 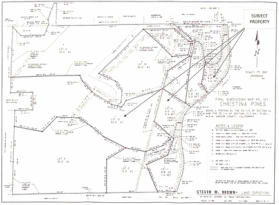 No Drilled/Capped Wells Electric Utilities available to Lot. Includes CC&R’s to help maintain a quality environment. Some existing private financing possibly available.